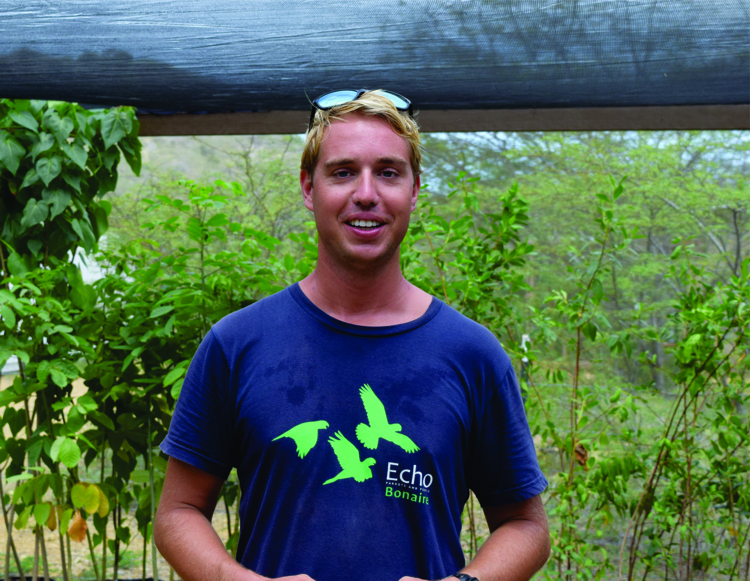 Reforestation Manager, Querijn Coolen, seen here in one of the greenhouses of the Echo project, says that the Foundation does not only sell local trees to anyone interested, but will also provide free advice as how to best treat them. Photo: The BES-Reporter. Kralendijk- The Echo Foundation at Dos Pos, close to entrance of Rincon, today held an open house to give interested parties a firsthand look at what will ultimately lead to the planting of around 20,000 trees in various locations on the island. As part of the reforestation project, mostly indigenous trees will be planted, although several non-indigenous trees will also be included. The non-indigenous species have been chosen for a number of favorable traits, such as the fact that they can grow under the dry local weather conditions and the fact that they not grow at the expense of native trees. The Echo project started back in 2010 after American Sam Williams did research on the island and most specifically on the Lora population. Williams saw the need for more trees in the island’s nature to sustain the population of local parrots. The NGO he founded has, by now, grown into full-fledged organization with four paid employees and several volunteers, both local and from abroad. The project receives the necessary funding among others from the Government of Bonaire and the Dutch Ministry of Economic Affairs. Assistance is also received from the Dutch Caribbean Nature Alliance (DCNA). The project is at present being led by American couple Nathan and Lauren Schmaltz, who live on the grounds of the project. A reforestation manager, a part-time nursery manager, an education assistant and a communications assistant are also employed by the Foundation. 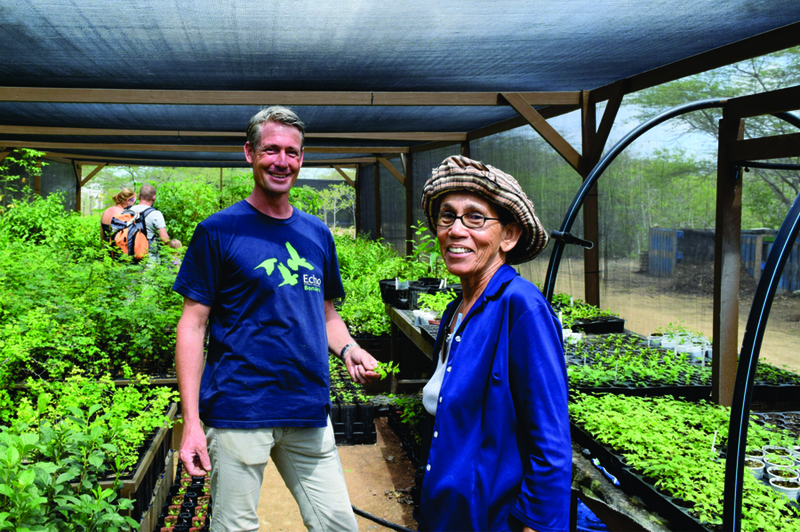 Nursery Manager Johan van Blerk seen here with tourguide Maria Koeks of Soldachi Tours, amid the many seedlings grown by the Foundation. Photo: BES-Reporter. Although the main purpose of the foundation may be to ensure an adequate habitat for the Lora population on the island, the reforestation efforts also serve a second goal: the original vegetation of the island is partly restored and will for instance prevent erosion. Species which are cultivated by Echo include the Red Saddle Tree, the Taki, the Calabash and the Wayaca. Anyone interested in the work of the Echo Foundation can get a tour of the project area every Wednesday at half past five in the afternoon. The staff and volunteers explain to visitors what the Foundation does and how the trees are grown from seeds. There are various greenhouses which can be admired on the project grounds. Why not on saba also, this sounds really interesting. 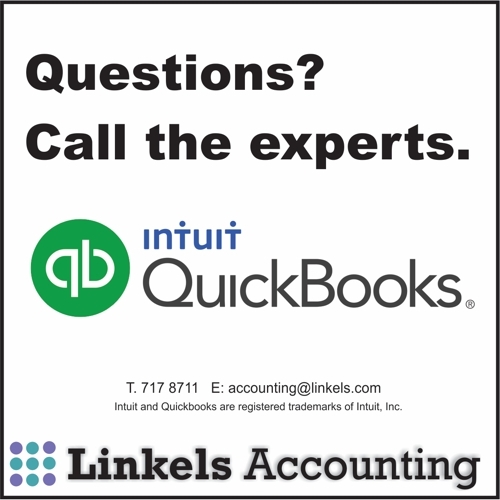 would like to be a volunteer when on the island—how? Hi Phil, maybe you could check the Facebook Page of the Echo Foundation and contact them.